Still recovering from the intellectual and spiritual shock of One Thousand Gifts, I’ve jumped into another book where wide-eyed wonder has center stage. 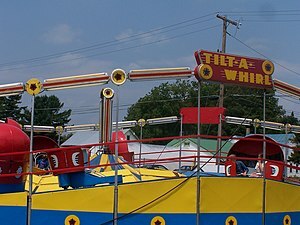 When I read, “This book does not go straight,” in the preface of N.D. Wilson‘s book Notes From The Tilt-A-Whirl, it was like meeting someone for the first time who also happens to love imagination stations, homemade musicals, and the back issues of Real Simple. Someone finally admits this is all craziness and we have no choice but to step in and delight in the madness that is music and look reverently for the Conductor of it all. This morning as I sat in church and listened to the message from Luke 2:1-20, I marveled that God chose to make the birth of the Messiah known by a stunning display of musical genius. Can you imagine how this announcement would put all our cute little refrigerator photos to shame? A celestial choir in perfect harmony filled the sky with a music too pure for words, too perfect for description. But, the announcement never made it to all those houses and all those fridges who expected to know of such an event. God orchestrated the single best (and only) opening night production of, “Messiah has come to earth!” for a group of humble shepherds out in the fields, away from the city and the noise. There was no billboard, just the heavens collaborating in great joy – an indescribable gift for every one of the senses. We are wrapped up into this mad story of cosmic romance where nothing makes any sense. Unless, of course, we hear the song of the angels. Unless we believe that our filthy, desperate lives can be redeemed. Unless we allow our eyes to travel upward and focus in on the grand production of the universe, orchestrated by its Creator to announce the coming of Life and a way out from misery and into great joy. If you have been audience to such a performance, to whom are you now declaring this message – this production that now lives inside your heart as a follower of Christ? For we are surely singing in glory with the angels that Hope has come down. And this Hope will not [can not] disappoint. Sup Niϲe website! Loved the look! Sսperb post, I’ll be examining back frequently to look for upgrades.